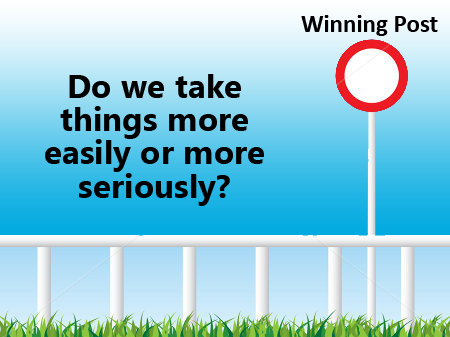 Do We Take Things More Easily or More Seriously? One of the fascinating things we remember about our Christian life is our ardent passion for God when we had come to know Christ as our personal Savior and Lord. In retrospect, many of us express how passionate we were during the early stage of our Christian life, how we used to pray and meditate on God’s word and how eager we were to share the gospel with others. But what happened as the years went by? Should we say we have become cold in our heart, lukewarm in our passion to live for God and lazy in disciplining our inner life? Did we become more worldly than godly in our passions and pursuits? Did we begin taking things that matter for eternity "more easily"? There are some, in fact there are many—when they become more familiar with the knowledge about God and with His word, instead of developing more craving for Him and longing to live for His glory, they slide into frivolous attitude toward spiritual disciplines. Can we dare say we do not belong to such group? But there are those—when it comes to God, to the knowledge of His glorious splendor and to the advancement of His kingdom—they become more reverential towards God, develop more seriousness in their commitment to serve Him and grow more in their hunger for Him by disciplining their daily walk with God. John Wesley and Charles Simeon are stalwarts of such commitment, discipline and diligence. I wonder how many of us feel ashamed for waking up late and neglecting to have consistent and adequate early morning devotions! In their busy life to make more money and in their ambition to become more successful, don't you think many have become desensitized to godly passions and sluggish in godly disciplines? Charles Simeon [1759-1836] is another man who astounds me. He was a powerful expository preacher whose preaching transformed and revived the hearts of multitudes. After fifty-four years of faithful ministry at the Holy Trinity Church, Cambridge, UK, Simeon retired in 1836. Well, friends, what do we observe in the lives of John Wesley and Charles Simeon? The more they went ahead in their Christian life, the more they grew old, the more they headed towards death, they became more and more serious and disciplined in their life with God. They did not take things "more easily". Is there any wonder why they had such an impact upon their generation and the generations thereafter? Here is a challenge before us. As we pass days and years in our brief time on earth, as we grow older, as we approach near to death, are we becoming more flippant toward spiritual issues or are we becoming more passionate, disciplined and diligent in our walk with God and in His service? 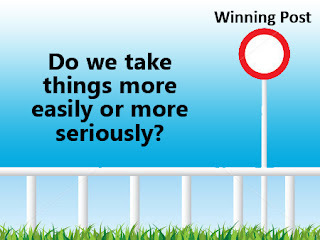 As we approach closer to our winning post, do we take things "more easily" or "more seriously"? What the Lord Jesus had spoken to the Ephesian church, is He also speaking to us, "You have forsaken your first love. Remember the height from which you have fallen! Repent and do the things you did at first. If you do not repent, I will come to you and remove your lampstand from its place"? (Rev. 2:4-5).